June 29, 2015 September 30, 2015 / Elizabeth T.
One of the most timeless trends for the spring and summer is the nautical trend, characterized by navy stripes, classic whites, and pops of red. True to the season’s hot and hazy days, nautical fashion incorporates laidback pieces that are not only comfortable but still exude just the right amount of style despite its casual nature! Paired with a small bag in a white and silver color, this whole outfits rather muted colors get a pop of sparkle. Are you all loving this nautical trend as much as me? Let me know what you think in the comments below! And of course, thank you all for all of the encouragement and beautiful comments! Just wanted to let you all know that I read each and every single one of them! 🙂 You’re all the best! Thank you Carmen! 🙂 You’re so sweet! And yes, the nautical theme is perfect for the summer haha! adorable that dress , love it!! Thank you Maria! 🙂 You’re too sweet! I love your comfy chic look. Thank you Zarrah 🙂 Loving your denim dresses look on your blog too! Love this easy & breezy summer chic! Thank you Jane! ❤ 🙂 Always happy to hear from you! Aww thank you so much for the comment Emmaline! 🙂 You’re so sweet! Love the skir & nice pics! Thank you Samio! 🙂 Nautical pieces are perfect for summer! I love the skirt. Thanks for sharing and happy Tuesday. Thank you dear! 🙂 Happy Tuesday to you as well! Cute outfit for summer, love your top and purse! 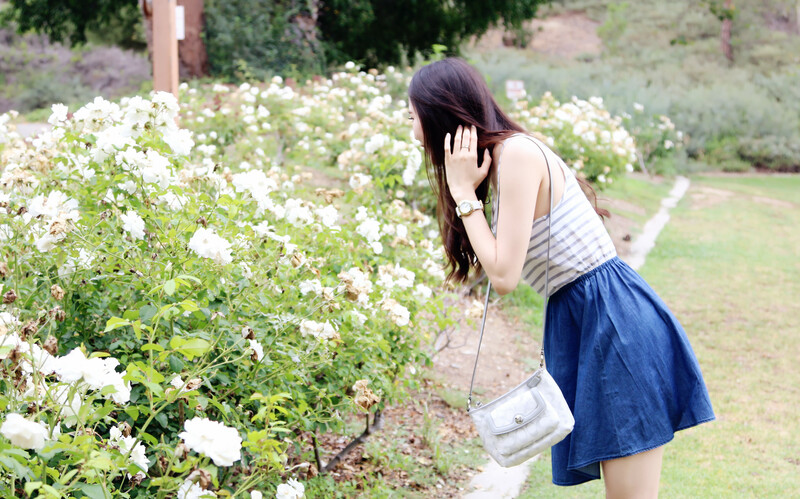 Cute summer outfit – perfect for 4th of July! And cool blog name BTW! ❤ Very creative! Loving the layout of your blog! ❤ So minimal but so pretty! Love how you can dress this style up or down depending on how you accessorize! Love the nautical look! Thank you so much for stopping by Amanda!